How can I make myself better at targeting or target the thing I want to hit? A very important part of increasing your gameplay is also playing around with the game Settings. For this, you can go to Settings -> Controls -> select Minions and Towers. After that, you’ll see a button that allows you to prioritize minions or prioritize towers. What are some of the various stat caps (Cooldown, Movement Speed, Life Steal, Attack Speed, Armor Pierce, Movement Speed Reduction) a hero can have? I have too much Gold late into a battle. What should I do with it or spend it on? Many players have suggested to sell your boots (+Movement Speed) and buy a resurrection item. You can also sell certain low-price items and purchase more expensive ones that have stats that are good for your hero. Once you get more used to understanding your enemy team’s composition, you can also purchase items that act as counters to enemy hero abilities and stats. Which hero should I play? We have a ton of heroes for you to choose from! Here are some things to consider when deciding which hero to play. 1) What’s your playstyle? Like large teamfights? Enjoy ganking from the jungle? 2) Try our hero finder feature from the Main Menu -> Heroes -> Suggested to get an idea of where you could start first. 3) Try our awesome Practice mode in the Training Camp. You can try all heroes for free in this. After giving them a test run, you’ll have a much better idea of who to try. Every player has their own preference, and it depends on a few things. Do you like dealing a lot of damage in a short time with high mobility? Try Assassin. Do you like taking damage for your team and being the beacon for teamfights? Try a Tank. Do you like being able to deal damage as well as taking it? Try a Warrior. Do you like dealing high magic damage from afar? Try a Mage. Do you like healing your teammates and helping everyone else? Try a Support. Do you like high physical DPS from afar? Try a Marksman. How much Gold does a tower/Abyssal Dragon/Dark Slayer provide? There isn’t a set Gold amount – this is based on how much time has eclipsed, so each one will become worth more as the battle progresses. If I keep purchasing the items that appear during battle, it will buy items based on the order I put them in my build (left to right)? Yes, the system will attempt for you to purchase items to allow you to obtain the items in your build from left to right. Why is the SEA version missing heroes from the EU version? SEA and EU are both operated differently, so it will have a different schedule for hero releases, free hero rotations and events. For any inquiries regarding the SEA version, please contact Garena’s customer support directly. Do we always add new heroes to the game? Yes! In addition to balancing our current heroes, we also add new heroes to the game. We usually show previews of new upcoming heroes on Facebook (facebook.com/arenaofvalor) and Twitter (twitter.com/arenaofvalor). What is a Free Hero Rotation? Every week, we put 6 heroes up for free for all players to try out. This is the best opportunity for you to extensively play these heroes before deciding to add them permanently to your roster! My team is getting attacked, but I need more Gold and EXP. What is more important: helping my team during fights or clearing out a minion wave to get more Gold and EXP? Most of the time, it’s more important to help your team fight, as this basically turns a 4v5 into a 5v5, which could be the difference between winning and losing. It’s also important to effectively clear minions in your lane, but when your team needs you, go and help! Why is pinging important? How do I do it? Pinging is important because it helps you quickly communicate something with your teammates while emphasizing your location. The three main pings are on your upper right below the settings icon. Whenever you ping, it will show a message while pinging your current location. Use these when you need to quickly communicate a general idea to the team. How do I ping and try to get the attention of a certain player have my team focus on a certain hero? Expand your minimap by tapping on the magnifying glass icon on the upper left and then tap on one of the hero bubbles. Your ping will be customized to include that specific hero. This is useful if you want to emphasize who should listen or if your team should focus fire on a certain hero. When do neutral monsters and tower regen runes spawn? How often do they respawn? Why did my teammate get angry when I got the last hit on the Might Golem (red buff)? If your teammate was the jungler for the team and needed the buff given by one of those early on, then they would get angry at you getting the last hit on it. Certain classes benefit more than others from the buff, so make sure you properly coordinate with your team and not accidentally get the last hit on it! Why do I keep getting hit by the tower? If you hit an enemy hero while in range of an enemy tower, it will target you. Make sure you only attack monsters or hit an enemy hero when out of range of the tower to prevent this from happening. Lanes (top, middle, bottom), river, jungle, base, what? The 5v5 map has three lanes (paths) split into top, middle and bottom. Generally speaking, bottom lane has a marksman and a support, middle has a mage, top has a warrior and jungle has a hero that can sustain themselves while dealing consistent damage. The jungle is basically any of the areas between the lanes that have neutral monsters and brush. These monsters also provide good Gold and EXP as well as a good place to set up an ambush/gank from. River is the water area that runs from the upper-left corner down to the bottom-right corner. If you destroy your opponent’s base, you win. This is the most important thing. I have a high KDA! Why did our team lose? Even if you’re getting in a lot of kills and are rarely dying, winning is about teamwork/coordination. You might want to see how you could either protect your squishy teammates, support your tank with damage or ensure you guys win more teamfights instead of you getting in individual kills. Also note that even if it seemed you were winning throughout most of the game, they only need to get in a few good teamfights and tower pushes to turn the game in their favor. This is the beauty of MOBAs and teamwork. Why do I lose health so easily? To be effective at staying in your lane and gaining Gold/EXP, you need to know how to avoid enemy attacks while also getting in your own attacks. It is usually a good idea to let your minions (small guys that spawn in waves from your base) first engage their minions before fighting, otherwise their minions may target you. To keep your HP up, make sure you use your regeneration next to the recall (return to the base) button as well as the regeneration located behind the tower. Make sure you don’t get hit while under the effects of regeneration, otherwise it will get interrupted and end early. For fighting the enemy, be aware of what abilities they’re using and their range, so you could ideally avoid their abilities while you could get yours on them or the minions (Gold/EXP). This is especially true if you know an enemy hero has some form of CC, as they will most likely open on you with one, preventing you from escaping while their teammates gang up on you. Making sure you don’t get caught unaware is important, especially if you’re a high-damage, low-health class (Mage, Assassin, Marksman), as you dying means you won’t even be able to get in your damage. Why should I kill the dragon (Abyssal Dragon) or the big purple guy (Dark Slayer)? Killing these can significantly help your entire team out through the Gold/EXP/buff (Dark Slayer) they provide, but you usually need teamwork to take them out. If you notice a tank or someone pinging/alerting you to help them kill it and the others are going, it’s usually a good idea to do this. Be aware though that if the enemy team knows you’re doing this and you’re all evenly matched, you guys might get ambushed in the middle of fighting one of the monsters. If you’re able to take one down though, it is extremely good for the entire team. Why do certain items appear asking me to buy them? Based on your item build that’s set pre-game, it will help you choose those items for purchase as you gain enough Gold through playing the game. Why do I get killed so easily by the enemy? They always seem to team up on me! A common way to get killed is by getting caught unaware away from your tower. Be aware of the minimap at all times and understand where others might be. Also be aware if your teammates tell you to be careful and go back. If you want to be safe, make sure you’re near your tower when you aren’t sure where enemy heroes might be hiding. You can also stay away from brush areas alone, as you could easily be ambushed by a hero. Also, if you’re charging into an enemy while they’re at their tower, their tower is going to deal a lot of damage to you. What is brush and how can I use it well? The brush (green grass) can help hide you from others outside of that brush area. Please note that if you attack something from the brush, you’ll be revealed on the minimap. Also, whoever else is in that brush area will be able to see you. If you somehow walk outside of the brush area and back in it, an enemy could see you move on the minimap and still be aware that you’re in the brush, so use it carefully. What are some of the attributes shown with my heroes and equipment? Max HP Amount of damage a hero can take before dying. Also affects certain abilities. Max Mana Amount of mana available to a hero, used for abilities. Attack Damage Increases your hero’s basic attack damage and increases the damage of some hero abilities (usually abilities that cause physical damage). Ability Power Increases the damage of some hero abilities (usually abilities that cause magic damage). Armor Reduces physical damage taken. Armor Pierce Causes a target to take damage as if they had less Armor. Magic Defense Reduces magic damage taken. Magic Pierce Causes a target to take magic damage as if their Magic Defense was reduced. Critical Chance The chance that one of your attacks will trigger a critical. Critical Damage The base amount for Critical Damage is 200%. This can be increased with equipment and Arcana. Movement Speed This increases your base movement speed by a set percentage. Life Steal A percentage of your basic attacks will recover your HP. This applies to damage done after a target’s damage reduction (Armor) is calculated. Magic Life Steal A percentage of damage generated by your abilities will recover your HP. This applies to damage done after a target’s damage reduction (Magic Defense) is calculated. HP/5 sec The amount of HP your hero naturally recovers every 5 seconds. Mana/5 sec The amount of mana you hero naturally recovers every 5 seconds. From the main menu, tap on the icon with two people on the bottom right then tap the Add Friend button. First enter your friend’s in-game username as it EXACTLY appears then tap the search button. If the player is found, you can then send a friend request. How do I get more heroes to use? Besides using Gold or Vouchers to obtain new heroes, the easiest and most effective way of increasing your roster is through the Road to Glory! Road to Glory is our daily quest mechanic that basically gets you a free hero each time you complete 3 matches. Only Standard (casual) or Ranked Match that are fought normally (without excessive AFKers) count towards this quest. How do I get awesome skins? If you don’t own the hero and you want to purchase the skin, the game will prompt you to first purchase the hero using either Gold or Vouchers. We also sometimes have other ways to get skins such as promotional hero packs and Lucky Draw. What kind of Arcana should I buy for my heroes? It’s good to buy Arcana based on the hero you use the most or the class you use the most (Warrior, Assassin, Mage, etc.). To see exact recommendations on Arcana, from the main menu, go to Arcana -> Recommended -> Change (to the hero you primarily use). The recommended Arcana changes based on the level of Arcana you choose, so if you’re new or low on Gold, we recommend you look at Arcana Level I or II recommended Arcana. What are Gold, Gems and Vouchers used for? Gold: Used to purchase Arcana and heroes. These can be directly found under the Heroes and Arcana buttons from the main menu. Gems: Used in the Gem Shop (main menu -> Shop -> Gem Shop) and can currently get you a Gildur Value Pack (buy Gildur using Gems), Double EXP and Gold Cards, Magic Crystals (used for the random Lucky Draw), and Lvl 2 Arcana Pack. Vouchers: These are used to purchase Heroes, Skins, Rename Cards, certain hero value packs, Sonika (for in-game chat), Magic Crystals (for randomized Lucky Draws), Double EXP and Gold Cards and more! Why does the game choose items for me to buy in the middle of battle? How do I change this? 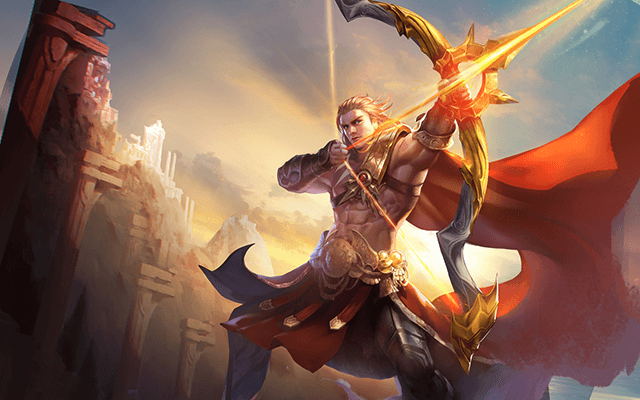 In Arena of Valor, each one of your heroes has a preset build that can be changed in Armory. To access this, from the main menu, go to Armory -> Change -> select the hero you want to set the build for. On the left, you can select between Attack, Magic, Defense, Movement and Jungling (for heroes with the Punish talent that want to specialize in jungling). Basic items are listed on the left, advanced items in the middle and end items on the right. Advanced and end items require a combination of basic items to be available for purchase. If you want to change your current build, tap on Change, remove the items you don’t want and select the items you want from the items listed below. If you don’t want to deal with this, the EASIEST way to get a good build is through the Pro Builds options. Simply tap Pro Builds and select a build. The builds listed here are based on the highest total number of wins made in games where that hero selected the build. It’s a great way to start. Based on your playstyle and the needs of your team, you can either select a hero you think is extremely fun, or you could select one you think that most teams you’re in is generally lacking. If you are completely unsure of the heroes you’d like to try, from the main menu, tap Heroes -> Suggested (at the bottom) and try our Hero Finder. Based on your answers, we’ll help select a good starting class to play. As you play a few matches, you’ll then have a better idea of where you’d like to branch off.